This was my first year at C2E2, and hopefully not my last! The Defiance panel was a prime example of why we decided to attend. 15 minutes before the panel began we got into a line that looked a tiny bit daunting… it was the kind of line you wouldn’t want to get into in San Diego at Comic-Con, for fear you wouldn’t get into the room. But, at C2E2, that was not a problem. A little patience, a lot of nice people, a few minutes, and suddenly you find yourself seemingly within 20 or 30 rows of the front of the row. It was amazing! A slide flashes across the screen multiple times as you wait for the panel to begin, it isn’t just your standard please be thoughtful and considerate of those around you, but it asks that you avoid recording the panel, and limit yourself to the first 5 minutes of the panel. I forget the exact wording… but the result was an audience that was focused on the actors on the stage, and what they were saying, not the screens in their hands, or their efforts to capture digital moments to take home and share with others. Would a couple dozen photos of each actor have been nice? Sure, Grant Bowler was incredibly charming, and quite eloquent as he pitched the show, and Jaime Murray was entertaining as she talked about the evolution of her process for getting into make up as the season has time has passed, and Tony Curran and Grant Bowler could not resist giving Jesse Rath a hard time when he mentioned the need for 5 handmaidens to help him get OUT of his waterproof make up at the end of each day. But really, just how much of that laughter, and how many of those megawatt smiles could our cameras have captured? Instead of dividing our attention between trying to frame candid photos and “get” what they were saying, we heard about how the production team behind Defiance took the time to build 7 blocks of the town. And while the buildings might just be facades they took the time to consider what kind of people, culturally yes, but beyond that situationally, would be building them, which is why a lot of the buildings are built out of recycled materials. Old containers, and train cars and the like. And the actors talked about how it feels to truly be able to WALK between the buildings and stroll along these seven blocks instead of having a tightly confined area in which to do each scene. Jesse Rath got off a particularly nice nod to a fandom when Grant Bowler was asked about the inspirations he drew on to create his character, lawkeeper Nolan, and he was talking about Han Solo, and Indiana Jones, and a lot of old western heroes, and a lot of great, brown coat wearing figures through the years, and how you would see them, and their brown coats… and Jesse Rath perked up and asked, “so you’re saying you’re a brown coat?” That was just one of the many moments when it was clear that this cast was in tune with their audience, and one another. Jesse Rath mentioned working on a series of Behind The Scenes videos that sound very interesting, and also mentioned the very interesting experience of realizing that many of his co-workers were so accustomed to seeing him in his alien make-up that they did not recognize him out of it. For those who aren’t aware, there is currently a free book for Kindle (I haven’t checked to see if it is available for other eReaders, called Defiance the Essential Guide, which among other things has a basic run down of the characters, where buildings are in relationship to each other, and might be a nice way to refresh our memories between season 1 and 2, which has had a longer than average hiatus. Grant Bowler did mention that Season 2 will have a lot more intensity to it. That where Season 1 was establishing the world Season 2 will be moving forward, which on the one hand I was happy to hear, but on the other hand, I’m not entirely convinced I want. I enjoyed Defiance in part because it was a light, fluffy show. I didn’t have to pay attention to a thousand and one plot threads, but instead I was able to tune in each week, and escape into this alternate version of Earth, in the future, and just wonder, what if. It was… relaxing sci-fi. And for that, I enjoyed it immensely. We shall see what Season 2 holds. This entry was posted in Convention, Television and tagged C2E2, Defiance, Grant Bowler, Jaime Murray, Jesse Rath, SyFy, Tony Curran on April 30, 2014 by Kay. 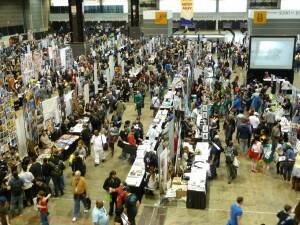 The exhibit hall floor of Chicago Comic & Entertainment Expo (C2E2) is a manageable size. Easy to cover in the course of one day, a floor where you can see something of interest, and remember where it is so you can go back and find it again later, but big enough to find a wide variety of interesting booths. As for the artist’s alley? It is excellent! A large area full of very talented people. This is a section of the exhibit hall that was filled with foot traffic throughout the three days of the convention, and with good reason. Every section of table had excellent art on display, and the countless opportunities existed to get a sketch from favorite artists, or new discoveries. One of my favorite aspects of the exhibit hall floor was the elevated food court, where you could not only take a break and grab a snack, but get an overview of the rest of the exhibit hall. 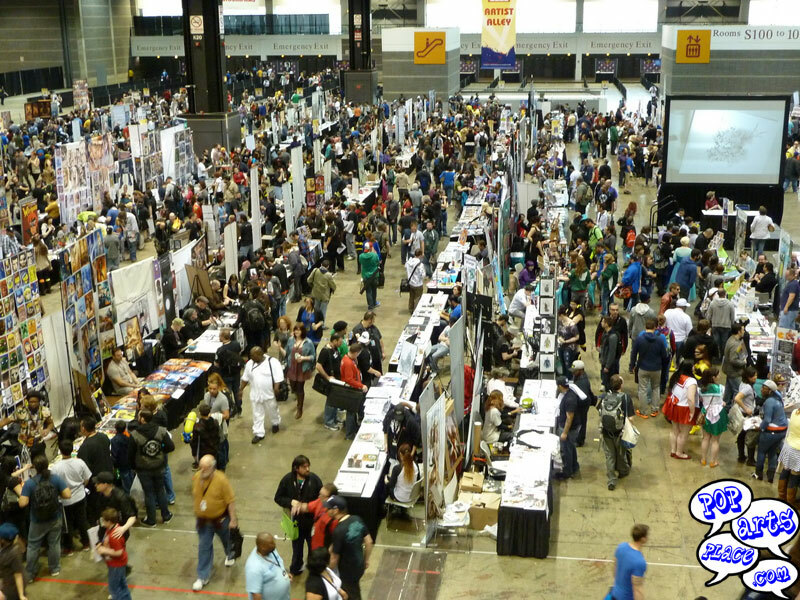 The ability to get a sense of the scale of the exhibit hall floor, see where things were in relation to one another… and see a drone being flown by one of the booths! This entry was posted in Convention and tagged artists alley, C2E2, Convention, exhibit hall on April 30, 2014 by Kay.